Berlin used to have a very well organized network of street cars – trams – or German: ‘Strassenbahn’. After the war – or actually after Berlin was split in two by the Berlin Wall, West-Berlin closed all Tram lines one after another, following the example of other European cities – giving way to supposedly more ‘flexible’ means of transportation: cars and buses. Also in East-Berlin some tram lines were closed after the City was divided – but not all. Not as many people owned a car as in West-Berlin, and Public Transport was more important also politically. So most of the tram lines were actually kept in operation over the decades. 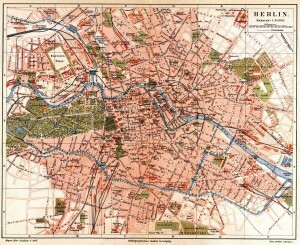 Today it can be considered a stroke of luck in the history of Berlin, that the East-Berlin tram grid was kept ‘alive’. It would never have been possible to reinstall the tramway system as we know it today, if East-Berlin had also closed all the lines. The first Berlin tram line, which was also the first tram in Germany, was ‘powered’ by horses. It opened in 1865 and first operated between Brandenburg Gate and Charlottenburg. It was soon very popular and then expanded towards Museum Island (Museumsinsel) so that it basically connected the City Castle (Stadtschloss) with the Charlottenburg Castle (Charlottenburger Schloss). 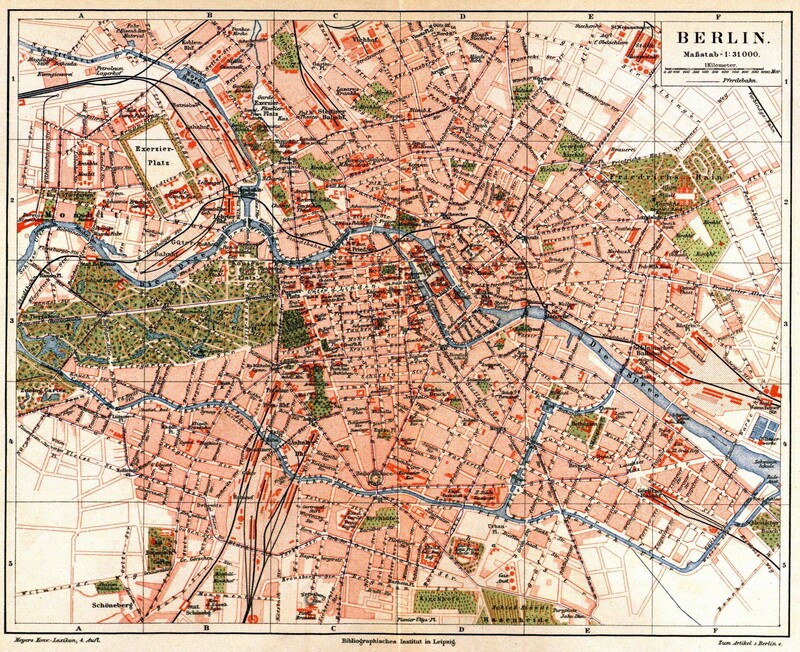 Over the years more and more horse powered tram lines opened – soon Berlin was covered by a grid of different lines connecting the different districts. 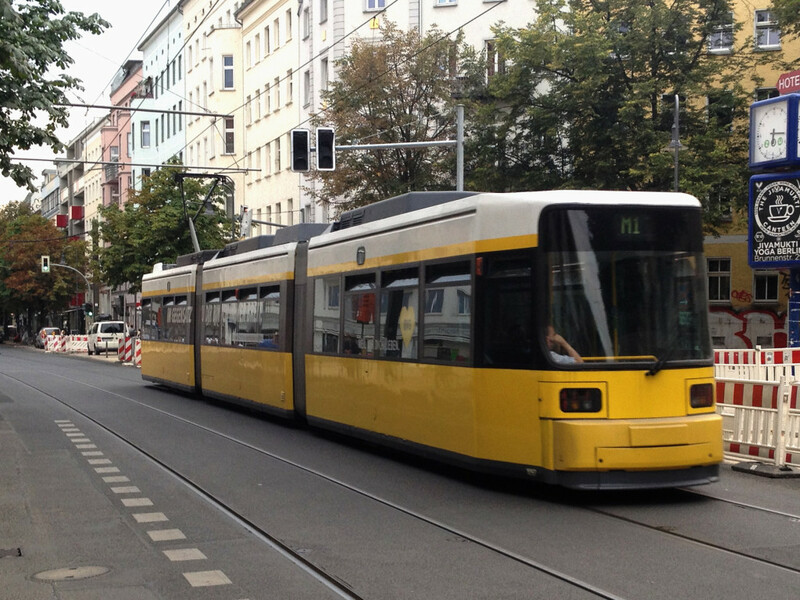 In 1881 the world’s first electric tram line was opened in Berlin. It first only operated in Greater-Lichterfelde (Groß-Lichterfelde) and its inventor, Werner von Siemens, called it ‘a high line taken off it’s columns‘. He originally wanted to build an elevated railway ‘Hochbahn’ (‘high line’) in Berlin – but the City Council wasn’t convinced. Only 21 years later Siemens could then build the Berlin Hochbahn. The first tram lines were still dangerous – the electric power came directly from the rails – so the first tram lines had to be fenced in. Later the tram was powered by ‘battery cars’ – which was safer than the electric rails, but not really a practical solution. Only when the first electric streetcar with overhead contact wires were introduced in Berlin in 1901, the tram became a huge success: a safe and affordable means of transportation for the masses. Shortly after the Berlin Wall came down and the two Berlins were reunited, negotiations about the future of the Berlin Tram grid were held. Some people saw the run down East-Berlin tram grid as a burden – others as a chance to enhance the Berlin public transport system by reactivating the tram grid. Long story short: the tram grid was reactivated – and since 1991 eleven new lines were either opened, or reopened, or extended. Today various tram lines are connecting East and West-Berlin and play am important role in the overall public transport concept. And more lines will be opened in the future: there are for example plans to extend the tram line M10 from Warschauer Bridge all the way down to Hermannplatz. You can actually see the tram rails built into the Oberbaum Bridge (Oberbaumbrücke) when it was renovated in the 90ies. But that expansion will probably still take a few years to come true. A couple of years ago Berlin’S public transport service provider BVG introduced the concept of the M-Tram and the M-Buse – or Metrotram and Metrobus. There is basically no real difference between a regular tram and an M-Tram except that trams on the M-lines are going more frequently – and they are operating 24/7. By day an M-Tram should be available at least every 10 minutes – by night every 30 minutes. From time to time the Denkmalpflege-Verein Nahverkehr Berlin e.V. organizes special sight seeing round trips in historical trams. You may find out more on their website at dvn-berlin.de. You want to party in a Tram and/or rent a Tram for your party? Of course that is also very well possible. As you might already know there are all kinds of different bars in Berlin. And so Berlin has also a bar built inside a tram which you can rent for whatever party you want to celebrate: the FahrBar or BERLINERFARBAR is a cozy old tram with a built in bar, washrooms, and a proper sound system. Further information on the website of BVG. and on the website of the company Zinnkann Events that actually runs the bar.